In the stingingly satirical stories of Friday Black, Nana Kwame Adjei-Brenyah dissects the dehumanizing effects of capitalism and racism. He picks five story collections that shaped him as a writer. Lynne, in the first gesture of what would become a many years long mentorship asked me, “Who have you read? And what are you reading?” I don’t remember what books I offered up to her, but I do remember knowing that I hadn’t read enough. I had already been a voracious reader, but I had never read with direction or purpose the way I did after that first meeting. Part of the deal was that, in each meeting, I had to report to Lynne all of my noticings on the stories I’d read since we’d last spoken. This forced me to read closely, to flood the margins with my annotations. Now, my own debut collection is set to drop in October, and reading great fiction is the first and most important thing I tell my students about writing. Read well and widely. Read what you love. It is the core of your craft. Read and get lost; read and parse the sentences apart like a surgeon. Obsess, let go. Sink into and rise out of the words that make you feel. Everybody says this because it’s true. Here are some collections that are beautiful and complicated and have made me a better writer. Eighty people waited in a darkened meeting room at the Hyatt, wearing mass produced paper hats. The White Hats were Beginning to Being. The Pink Hats were Moving Ahead in Beginning. The Green Hats were Very Firmly Beginning all the way up to the Gold Hats, who had Mastered Living and were standing in a group around the Snack Table, whispering and coffering and elbowing one another whenever someone in a lesser hat walked by. My sincere first thought upon reading that opening was something along the lines of: “What the hell is this?” I felt disoriented, like maybe I wasn’t being taken seriously. The stories Lynne gave me were supposed to be literary, a term that was sacred to me at the time. This felt…silly? I read on because I always did what Professor Tillman told me to do. And before I’d finished the second page I realized I was smiling, hard. I devoured the story. I read “Brownies,” one of the many spectacular stories in this collection, because it was assigned for a class. Afterward, I felt deeply that I had to read everything that Packer had ever written. Drinking Coffee Elsewhere drew me in by creating a layered, rich feeling of a life lived and being lived for each of the principle characters on the pages. Packer writes stories with care and consideration. The richness of the interior life of her narrators gave me something to aim for in my own work. Packer allows her characters to make discoveries about themselves under duress in ways that feel honest. She presented black characters that navigated the world in a way that inspires me still. I also loved and noted specifically the way Packer was seamlessly able to move from memory to action and back again in order to retroactively create evidence for characteristics her narrators had already displayed. I remember reading this book and thinking, “I didn’t know words could make me feel this way.” The characters in this book wander so pitifully and still they carry with them stories bursting with a sense of purpose. Fuckhead, as he moves through these pages, takes us on journeys mundane and profound, terrifying and hilarious. I once wrote a 20-page analysis of Car Crash While Hitchhiking, the first story in the book, and I could have written another 20 just thinking about the way Johnson was able to force the narrative to new registers via poetic language and stunning leaps of imagination. This master work taught me that even a man high on drugs, sopping wet with a sleeping bag tied around his neck like a cape, might “know every raindrop by its name,” that there is wonder, glory, and grit to be found anywhere. I’m always learning, and most recently Heads of the Colored People by Nafissa Thompson-Spires has taught me a lot. This collection is brilliant in how very aware of itself it can be as a book, and how that meta awareness enhances the work as a whole. I also love Thompson-Spires’ characters. They’re “quirky” in the best sense of the word. They are precisely themselves, specific, and their obsessions make them pop against their background. But they’re never reduced to these habits, styles, conditions, interests or dispositions. These things are a part of their whole, vibrant humanity. Thompson-Spires shows us that Blackness is many, many things. 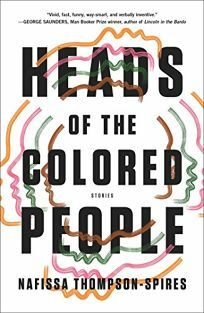 This, coupled with a precise and relatable negotiation of popular culture, makes Heads of the Colored People a collection that will be with me in my classrooms and in my writer brain for some time to come.